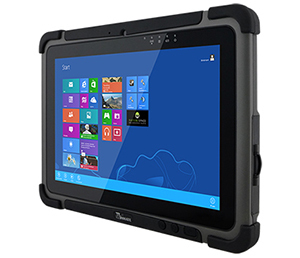 Winmate introduces the newest addition to its rugged tablet lineup with the M101B Rugged Tablet, a state-of-the-art rugged Windows 8-based tablet powered by the latest Intel N2920 Quad-Core 1.86 GHz "Bay Trail" platform. In terms of looks and design language, the M101B looks similar with Winmate successful M970D, but the device is actually significantly more advance and powerful. M101B supports a display with more than twice the pixel density of the M970D and offers superior quad-core processing performance as well as more advance graphics. 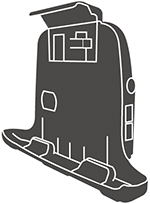 User may also include either embedded 1D/2D barcode reader or RFID reader. Winmate's 10.1" tablet is an attractive looking device; and also has a straightforward design with rounded corners, black, glossy glass covering almost the entire front side of the device, finished with protective doors and bumpers around the corners. This IPS Panel has bright backlight at 700 nits, and wide-viewing angle, resulting in versatile display for M101B. Wide format and high resolution 1920 x 1200 pixels results in ultra-sharp images. M101B can be equipped with either 3G or 4G LTE Gobi 5000 for lightning fast mobile broadband, through the easily accessible service window which is located on the back of the device. In the outdoor environment, tablets maybe dropped and rained on, so the ability to withstand a 4-foot drop and survive the water drops is vital for continual operation. Winmate M101B is designed from the start to handle the toughest environment. M101 is equipped with 5,300mAh battery as standard battery and battery life can be further extended by taking advantages of its hot-swappable battery design. Hot-swappable battery design allows the tablet to continue to operate even while the battery is being removed and replaced, for uninterrupted operation of the device. Built-in Barcode or RFID in the M101B provides convenient and robust capture of Barcode and RFID data for specific application such as Warehouse, Logistic or Retail and many others – in a complete one-piece solution. Provides optional connectivity to custom modules for special application (1 x USB2.0 or 1 x RS232), to maximize expansion and connectivity for special need. Vehicle docking is also available for the M101B that can be installed in any vehicle securely while also expanding the connectivity of it. With our quick release latch, the vehicle docking station allows users to easily remove the M101B and carry it on the field.